•Check Identify loops/braiding section and click OK. Progress can be followed in the status bar. Large networks will have large topological dictionaries and will take longer to process. The topological nature of the river network can also influence processing time; highly multi-threaded channels tend to take longer to process. •The tool will identify all polylines participating in a loop and encode the loop with an unique ID number. 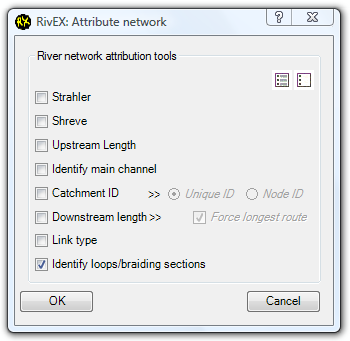 River networks generated from vectorizing raster stream networks do not have bifurcations and will not be attributed with loop ID's. •The tool will create a new field called LoopID, if it already exists it will be overwritten. The ID will start at 1 and count up for each loop family. Polylines remaining as zero do not participate in any loop. •A loop is a component of the network that has two or more channels. Imaging a fish attempting to swim upstream and it comes to a bifurcation. One side of the bifurcation could split again creating a multi-threaded section of network. These loops could be naturally occurring braiding, anastamosing channels or artificial channels associated with anthropogenic structures like water meadows or mills. •Thus a loop for RivEX could be a simple bifurcation or a highly threaded braiding system. In the image below a small section of the Alaskan NHD has been processed by RivEX and polylines in loops are colour coded by the unique ID given to the loop. You can see along the main stem, a long multi-threaded loop (green) with smaller simple loops (pink) upstream. •Once the network is encoded by LoopID you could generate statistics on the number of loops in a network, their size and distribution and use them to identify if a barrier is passable. •If a barrier (point) has been snapped to the network and you transfer the LoopID to it. The fact that it has a LoopID must mean there is an alternate route which is vital when considering the potential passability of a barrier.